My Favorite Gifts – Jamie | Faddegon's Nursery, Inc. Sometimes it’s difficult to find smaller holiday pieces that can fulfill the need to accent a small space while having a completed look. For me, this classic poinsettia swag trimmed with gold ribbon is an effortless solution. Measuring 18” in length, it’s the perfect size for a bathroom or closet door or use two to flank a garland or wreath. I picked this swag for its colorful, yet traditional style.Ribbon. I have to admit that I am a ribbon addict. I almost can’t contain myself when I see lots of ribbon. Twice a year we go to Atlanta. In the showroom that we select most of our ribbon from, our entire conversation may consist of oooo ahhh. Ohhhhhhhh. Look at this one. Mmmmmm. It is hard work to try to marry different colors and patterns well in advance, guess how much we’ll need etc., but it’s a challenge happily taken on. So many things can be transformed with the right ribbon. Wreaths, garlands, the edge of a mirror, any gift item, especially that stuffed animal for an adorable little friend. A length of ribbon is great for attaching holiday cards to. It’s an easy hang it anywhere accent! Beyond the holidays, add ribbon around the bottom of a lampshade, trim shelf edges or upgrade a bulletin board. It’s easy to find colors and widths that will speak to the décor of your room. Start thinking ribbon and you’ll find all kinds of great ways to give your spaces a lift!Much in art is all about light, reflected and refracted. Light bouncing and mesmerizing has long had the power to transfix us. Why? It may be innately human to be drawn to such a beautiful aspect of the natural world. The crystalline object seems to hold so much dimensional complexity and wonder. Now broaden your definition of the word crystal to apply to anything that reflects light and you have a way to create dimension, whether you’re making an object or enhancing one. Candlelight nearby will make your décor dance! You can turn your dining room light fixture into a thing of beauty by hanging glass icicles and ornaments at varying heights. Voila! With a bit of fishing line you’ve turned lackluster into luminous! You don’t have a light fixture over the table? No problem! Find a few branches, set them in a vase and hang your crystalline objects from them. You’ll be amazed at how such an easy project can bring so much enchantment to your table. If you want to be really daring and creative, affix a branch to the top of a cabinet or doorway and hang just a few shiny objects at the end. Now stand back and watch friends and family become absorbed in the beauty.Fresh holiday greens. It’s easy to think of this as one category, but when you take a look at the variety within this name, you begin to see how a style choice can be completed with your choice of greens. I love all fresh greens of course. The smells, the textures and colors. They’re all different. But show me incense cedar and I swear my heart skips a beat! I have an extra affinity for anything weeping or falling. I love weeping trees. I love the tumble of vining plants. Fresh greens are no exception for me. Incense cedar is an absolute waterfall of greens. The layers of finely cut foliage cascading downward, totally dripping with texture are what really finish a greens piece for me. If we’re lucky the ends sport tiny little gold buds, the very beginning of what would have been pinecones, giving the cascade a jeweled look. I love to wire a few branches together and add a bow. Done! Perfect I say!Talk about easy! This is my kind of bulb. 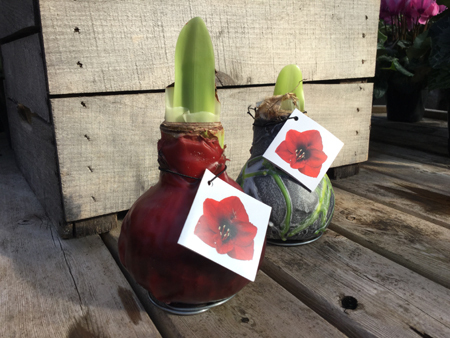 These amaryllis bulbs are coated in wax. No planting in a container, no water, no special light requirements, no worrying about caring for it later. The wax is colorful or plain, take your pick, and they come with a small stand already attached. Set it anywhere! A perfect gift for the un-gardener.